MoonMarble.com - Glass Eye Studio Egg Weight - "Lion's Mane Jellyfish"
Art Glass → Glass Paperweights & Decor → Glass Eye Studio Egg Weight - "Lion's Mane Jellyfish"
This is an glass egg paperweight made by the Glass Eye Studio in Seattle. It has a flat base that allows it to stand on end. This is a clear egg with a pink glass jellyfish captured inside. 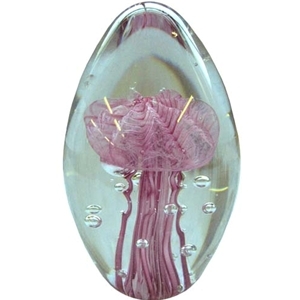 It also has air bubbles captured around the jellyfish to add more sparkle and dimension. Measures a very large 4 3/16" tall and 2 5/8" at the widest point. This is a hand crafted item and may vary slightly from the photo.